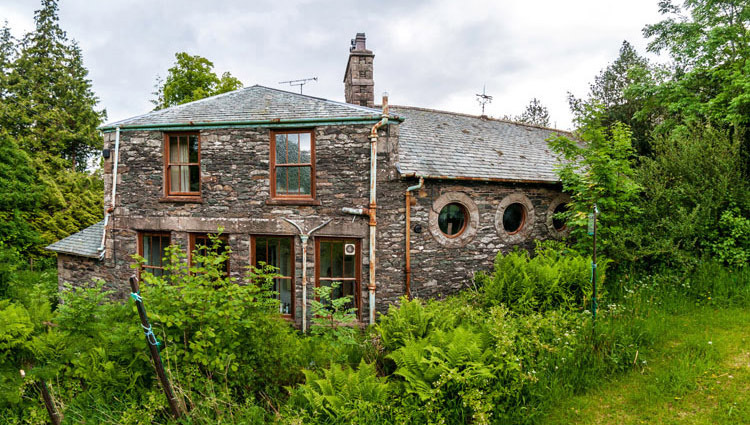 Ravensghyll Cottage; Swarthbeck Farm Holiday Cottages on the shore of Ullswater in the center of the Lake District, Howtown, Penrith, Cumbria. CA10 2ND. Ravensghyll Cottage sleeps up to 8 people. Ravensghyll is situated behind the large house Ravencragg and it benefits from a separate downstairs ensuite bedroom with king size double bed, as well as the three bedrooms and bathroom upstairs. It has extra amenities such as a dishwasher and its own private garden with picnic table and washing line. It is also the nearest of our properties to the lake shore, and there is plenty of car parking space in the yard outside the house. Downstairs there is a kitchen (with dishwasher)/dining room, sitting room with an electric fire, utility room, bedroom (sleeps 2) with en-suite bathroom, and games room (formerly garage) with table tennis. Upstairs, 1 double room, 1 room with bunkbeds (adult size) 1 twin room and bathroom. The house is is central heated throughout with an electric central heating system. There is a small garden with lawn and flower bed, and parking space for cars. For additional information please see the AVAILABILITY and the BOOKING pages. Please be aware that some of our properties are not really suitable for the very elderly or those with mobility problems, due to the geological location of our properties, overlooking the beautiful Ullswater, we are not very wheelchair-friendly, please contact us personally for more information. Ravensghyll Cottage has some steep stairs to second floor may be unsuitable for the elderly or disabled, please be advised that all our houses are Non-Smoking.